You have a new logo, now what? The new logo is finished, but are you done? You’ve got the new logo, new colors and some new brochures and a new website. Are you done? Can you relax? Nope. There’s always more to do. Just like your website needs to be monitored, updated and refreshed, your brand will need ongoing love and attention, too. Welcome to the ever-changing, constantly evolving world of marketing and branding. We’ve worked with clients who either have a logo they don’t want to change; or have rebranded and then realized they need help with implementing a cohesive program. After all, the new logo is only the thumbprint of the brand, it’s not the full wardrobe that will create a consistent, cohesive and recognizable brand persona. Depending on who you worked with for the new logo design you could have ended up with only basic components–two or three core colors and a black and white and color version of the logo. Or the design direction for all the potential brand applications is inconsistent or doesn’t cover all the needed options–from printed materials to PowerPoint templates, website or email formats. Or those who manage the brand internally discover elements that aren’t working—the color palette, the fonts, the way specific design elements are treated. As a result, the formats for communication tools aren’t coming together with impact and consistency to create a cohesive and effective brand program. Training for the administrative staff. Word and PowerPoint® templates to maintain consistency and reduce printing costs. Design templates to ensure brand standards are followed by outside vendors. Guidelines for versions of the brand and sub-brands. And a complete set of digital assets — the logo and its various options in black and white, grayscale, and PMS ink colors, as well as RGB and CMYK. You’ll need all of those file formats for black and white printing, laser printing, traditional offset printing and online presentation–whether PowerPoint or your website. When the brand program isn’t complete, our process addresses these issues holistically. We go back to the audiences first. What do THEY need to see, read, hear or understand at each point of choice? Address each connection with your brand where your target audiences will choose to take action. If the logo design is not going to change, we address color palettes, applications and supporting imagery. 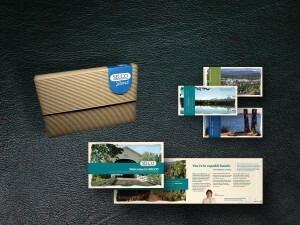 Formats of printed information can also have a big impact and support the brand. When we rebranded SELCO Community Credit Union, we didn’t change the logo. We created a look and feel that elevated their perceived value and distinguished them from other credit unions and banks. The final program fulfilled on their goal of being seen as the “Nordstrom of credit unions.” The packet we designed for new members also won a Diamond Award from the National Credit Union Association (NCUA). Once the brand elements are defined and guidelines provided, work with the team that will manage the brand at its many levels. Provide them with the resources they need—guidelines, templates or training. Templates will make everyone’s job easier, while providing standards for everyday communications that manage brand integrity. That’s why we’ve included “internal adoption” as an important component of an optimized brand. Just having a new logo and colors on company brochures, stationery and the website doesn’t mean you have built a brand where it counts—with the people who will manage it, implement it and represent it. Do you have a complete set of digital files in black and white, grayscale and color? In multiple digital formats? Does your staff have guidelines for colors and fonts? Are templates available for letters, PowerPoint, emails and other standard forms? Have you provided training for those who will manage and represent your brand? Do they understand the guidelines for application and the importance of maintaining consistency? Are supporting design elements and imagery defined? How does copy and messaging support your brand? Learn more about our brand optimization methodology on our website. Contact us if you would like a brand audit, or would like to take your new logo design to the next level. 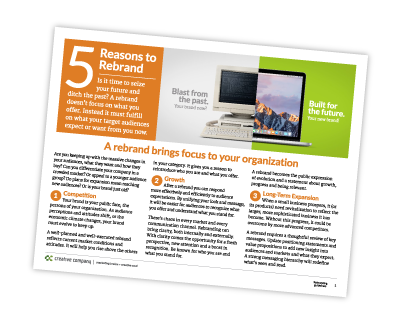 Interested in how identity guidelines can help your organization stay on track? Read our blog post about guidelines provided for these government associations.